Earlier this month I attended Monterey's annual Great Wine Escape Weekend and had a fabulous time. But who wouldn’t? The scenery is gorgeous everywhere you go. Outdoor and cultural activities abound. The cuisine is splendid, with top-rated chefs taking full advantage of just-picked produce in the region known as America's "salad bowl.” Not to mention just-caught fish landed by the local fleets, and locally-raised farm animals. And, of course, there was the wine. In the last decade or so many of California's wine-growing regions have emerged from the huge shadow cast by Napa and Sonoma with strong contenders of their own. One of the greatest success stories is Monterey County, which is producing sensational wines with intense varietal flavors. In an upcoming post I’ll discuss a few of these wines in more detail, but right now I’d like to pass on a few highlights of my trip just in case you’ll be heading coastward sometime soon. 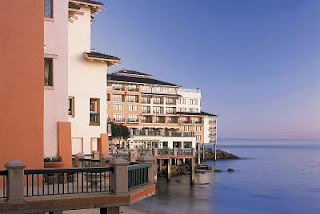 I stayed at the luxurious and excellent Monterey Plaza Inn and Spa, located on the bay side of Cannery Row. Whoever designed this hotel had the priorities straight: no matter where I walked or stood I was confronted with a view of that big blue bay and the endless Pacific stretching beyond. Throughout the public area are dozens of viewing platforms, balconies, plazas, umbrella tables, benches, and chairs where you can lounge while gazing outward. The huge lobby offers a veritable surfeit of comfy couches, all arranged in cozy conversational groupings with full-on views. I criss-crossed the outdoor piazza half a dozen times a day as I came and went, catching those awesome views at dawn, when the sky turned pink with the rising sun; at mid-day, when everything seemed to be one shade or another of blue; and late at night, when lights twinkled all the way down the Monterey Peninsula. My room was quite spacious and beautifully done. Even the best hotels seem to have boring art on the walls, but there was something here—a reproduction of an ancient Monterey Bay map—that I would like to own. I had a pretty garden view (water views are much more expensive). The highly-rated Duck Club Grill is here, as well as the more casual Schooners Bistro. A full-on spa and a fitness center are resident, but, alas, I never had time to use either one. If you’re into visiting wineries, you can’t miss with the absolutely beautiful drive along the River Road Wine Trail in the Santa Luca Highlands, where a dozen or so wineries—including Paraiso, Sleepy Hollow, Smith & Hook, and La Estancia—reside in bucolic splendor (many are open for tasting). Spending some time here, sampling wines and enjoying a picnic, would make for a memorable experience. The Highlands became an AVA in 1991. The vineyards planted high in the southeast facing terrace of the Santa Lucia mountains, looking out toward Salinas Valley, experience long sunny days tempered by elevation and cool maritime breezes in the afternoon—particularly good conditions for Pinot Noir and Chardonnay. In the warmer canyons and slopes, Syrah and other Rhone-type grapes do quite well. As always, I encourage winery goers to drive with care. If you know you’ll be sampling a lot, consider going with a professional driver. In Monterey, as in many wine regions, you'll find something to suit just about any pocketbook, from private limos to van tours. Our media group was very happy with Ag Venture Tours; they have pre-set tours you can join, or can work with you to craft a personalized itinerary. Another great wine adventure awaits on a drive through Carmel Valley, where many boutique wineries and tasting rooms have sprung up in recent years. Our group of writers visited the tasting rooms for Heller Estate Organic Vineyards, Joyce Vineyards, and Robert Talbott Vineyard and Winery. At the impressive Chateau Julien Winery Estate (pictured to the left) we sampled not only their excellent wines, but those of Galante Vineyards and Cima Collina. We also had a knockout lunch in one of the private rooms. All the wines we sampled that day were excellent—not just my opinion but that of most of the other writers—but my favorite wines of the day were from family-owned Joyce Vineyards. The story about how this family got into winemaking to begin with is pretty interesting: after buying land high on a Carmel Valley hillside, they determined that the slope behind their house was so extreme that a landslide might wipe them away, so they decided to plant vegetation to hold down the soil. Grapes seemed a logical choice, given the southwest facing slope and loamy chalk rock soil, and so in 1987 they planted their first grapes. As it turned out, Dr. Joyce had a talent for making wine. The winery now produces Cabernet Sauvignon, Merlot, Syrah, Chardonnay, and Pinot Noir. We tasted only Pinots on our visit, and they were among the best I’ve ever had: extremely berry, sometimes cherry, notes; soft tannins; always elegant, with layers that just keep coming. Marvelous! The wines have won many awards. On our Carmel Valley wine exploration we spent a few really delightful hours in Carmel Valley Village. Though I’ve lived in Northern California for a long time, and traveled in and around Monterey/Carmel/Carmel Valley countless times over the years, I had never heard of Carmel Valley Village. This charming, bohemian place has evolved on its own over the years; there’s nothing even remotely commercial about these two short streets of small, simple bungalows that date from (I’m just guessing here) sometime in the 1920s to maybe the mid-1950s. Many have courtyards and arbors, all are surrounded by long-established trees and gardens. They hold shops, cafes, an antique shop, art galleries, and, of course, wine tasting rooms. If this sounds good to you, the Village is about 12 miles in on Carmel Valley Road after you turn off Highway 1. If you’ve ever driven through the Salinas Valley on your way to and from Highway 1, you’ve probably seen the giant, 18-foot tall cutouts of farm workers beside the highway (left). That’s the outdoor art gallery of The Farm. The figures, by Salinas artist John Cerney, show men harvesting lettuce, one of a great many products grown here. This high-energy agricultural showplace is not only a farm but an education center where school groups and others come to learn about farming in today’s world. You can also buy fresh produce, take a tour, pet farm animals, and more. This is an enjoyable stop for anyone, but I imagine that kids, in particular, would really love it. Cannery Row has a few tasting rooms these days, and I managed to visit two. Scheid Vineyards Tasting Room, 751 Cannery Row: A relaxed and convenient way to sample Scheid’s superb artisan wines. You’ll find a tasting and lounge area with a fireplace made of local stone; wine-related items are also for sale. Classes are given (winemaking to blending), as well as food and wine seminars, and you can arrange for trips out to the vineyard. Scheid makes delectable wines, many in the $50 range. But when I visited, the big hit among a group of wine writers was the $19 2007 Odd Lot Red. It was delish—and, as it turned out, consisted of a happy blend of various lots of wine that “highlights the best traits of each to achieve a harmonic whole.” That’s not marketing hype; it’s true! Pierce Ranch Vineyards Tasting Room, 499 Wave Street: Just off The Row and just opened, this attractive and friendly tasting bar is the place to go if you want to try something new. To be sure, Pierce offers wines you know about such as Cabernet Sauvignon and Syrah, but you’ll also find an eclectic mix of Bordeaux, Rhone, and Iberian varietals you may not know: Tempranillo, for instance, acknowledged as the flagship wine of the Iberian Peninsula. Or try Touriga, Cosecheiro, Vinho Doce, or Albarino. These varietals have been chosen because they grow quite well in Monterey County.